EN ISO 20749 Dentistry - Pre-capsulated dental amalgam - ISO 20749:2017 specifies the requirements and test methods for dental amalgam products supplied to the user in capsules, pre-dosed with dental amalgam alloy and dental mercury in quantities suitable for the creation of a single dental restoration. ISO 20749:2017 specifies the requirements and test methods for dental amalgam alloys that are suitable for the preparation of dental amalgam and the capsule, together with the requirements and test methods for that dental amalgam and the requirements for packaging and marking. ISO 20749:2017 is not applicable to dental amalgam alloys supplied as a free-flowing powder in bulk quantities or as powder compressed into tablets, or to dental mercury supplied in sachets or bulk quantities. This document is not applicable to other metallic materials in which an alloy powder reacts with an alloy that is liquid at ambient temperature to produce a solid metallic material intended for dental restoration. Specific qualitative and quantitative test methods for demonstrating freedom from unacceptable biological hazard are not included in this document. For the assessment of possible biological hazards, reference can be made to ISO 10993-1 and ISO 7405. 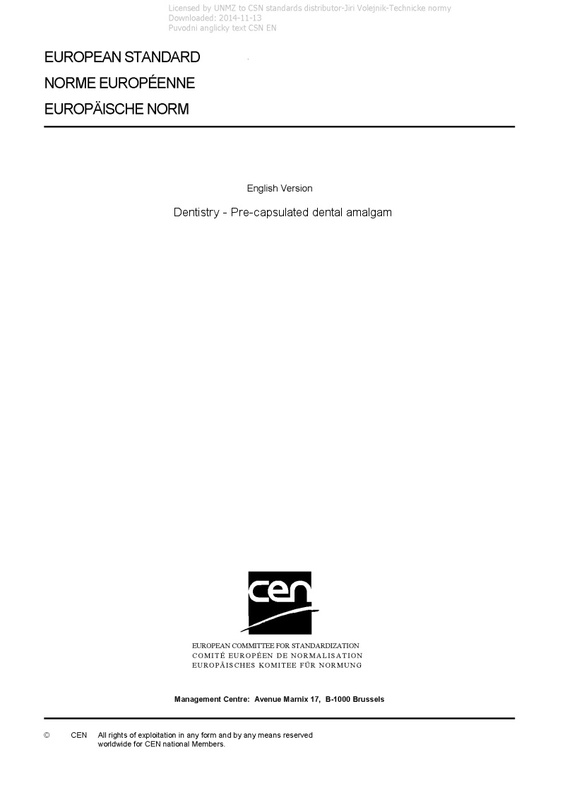 The scope of this document is restricted to dental amalgam products marketed in pre-capsulated form alone. Other products intended for use in the production of dental amalgam restorations (dental amalgam alloy as a free-flowing powder supplied in bulk masses, dental amalgam alloy powder supplied as compressed tablets and dental mercury sachets) are within the scope of ISO 24234.